Hello friends! I’m here just to ping you about the bird card I warned you was coming….it’s this little colored pencil cutie. Hop over HERE to see the video! That’s an outstanding coloring !! another great card Sandy.. the coloring is fantastic ….You’re so good……..
Sandy, I always love your colored pencil cards! This is so petty, and I can’t wait to watch the video. TFS!!! I absolutely enjoy every one of your videos. There is always something to learn here. 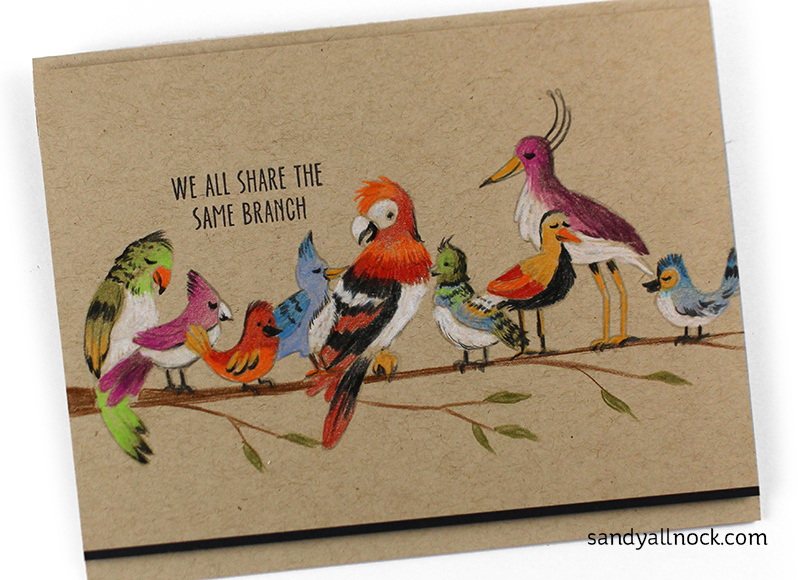 Thanks Sandy for sharing your amazing card, these birds are coloured so beautifully. Watching you always makes me feel like there really is hope that even I can learn to do this. What awesome colors on these gorgeous birds! I love this one, Sandy!! Love this card . . . as well as the one from this set that was posted a couple of days earlier. Cute, Cute, Cute. I’m really enjoying these Ellen Hutson’s “United We Flourish” sets, especially when you guest post! Great card Sandy, I love all your coloured birds. Although you think that you don’t see these colours in nature, then I can tell you are thinking wrong, they are. You won’t believe what a colourful birds there are flying on our beautiful earth! Thanks for this lovely video tutorial. Looks great and for the record I have birds that visit my yard bringing combs for the windy days. Very neat and clean birds stop by. Sorry, had the link wrong. Should be HERE. Where can the stamp & die set be found? Neither can I…reach the video. Am using Chrome. Nor, is does the link to Ellen H.’s for the stamp set as listed in your email to me. Darling card from the picture but cannot reach the video from your link–404 error.